the shiny red "reddit" is in the gold woman. it is face up. the ground is dirt. the silver albatross is a few feet in front of the woman. it is facing the woman. it is cloudy. 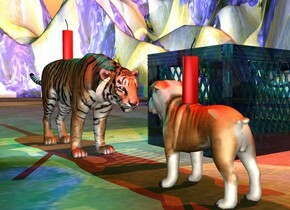 the tiger is to the left of the woman. it is facing the albatross. the huge fish is on the grass mountain range. the mountain range is 60 feet wide. it is cloudy. 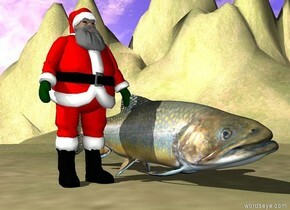 the very small Santa is next to the fish. 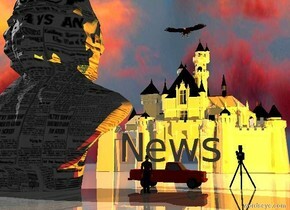 the humongous [newspaper] statue is 100 feet in front of the shiny ivory castle. it is cloudy. the man is a few feet to the right of the statue. he is facing backwards. the ground is shiny. the red truck is 10 feet behind the man. it is facing right. the huge eagle is 2 feet above the castle. the camera light is black. the red light is 3 feet above the car. the yellow light is two feet to the right of the red light. the huge "News" is above the truck. the very huge camera is 4 feet to the right of the truck. the tall white mountain is on the tall klee mountain range. the penguin is on the mountain. the ground is water. the tiny matisse dragon is 6 feet above the mountain. there are 2 birds a few feet behind the dragon. 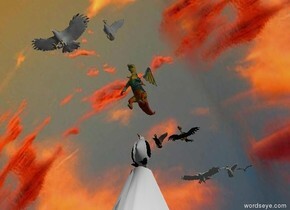 there are three white birds 14 feet behind the dragon. it is cloudy. 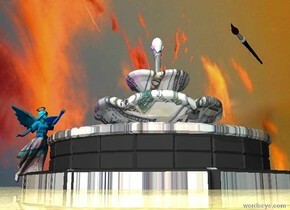 the two silver birds are 6 feet in front of the dragon. 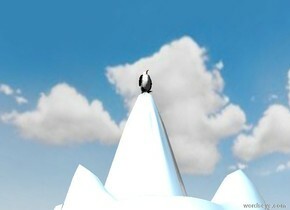 the penguin is on the tall shiny white mountain. it is cloudy. the [garden] wall is 5 feet wide. the ground is shiny grass. the small bird is 5.5 feet in front of the wall. it is 2.5 feet above the ground. it is cloudy. the small fence is 1 foot in front of the wall. it is 10 feet wide. the very small man is 3 feet in front of the fence. He is facing the wall. the small gun is -1.7 inches to the right of the man. it is 10 inches above the ground. it is facing left. 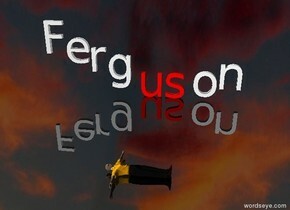 the "Ferg" is to the left of the red "us". the "Ferg" is leaning to the left. the "on" is to the right of the "us". the "on" is leaning to the right. the "on" is two inches above the ground. it is cloudy. the ground is black and shiny. the man is 5 feet in front of the "us". he is 2 feet tall. he is facing up. he is facing right. the [color] angel is on the shiny dirt ground. it is cloudy. the [money] fountain is 1 foot in front of the angel. the enormous brush is -2 feet above the fountain. It is -2 feet in front of the fountain. the purple light is to the left of the angel. the blue light is to the right of the angel. the tiny red elephant is leaning 50 degrees to the right. the small blue donkey is leaning 20 degrees to the left. 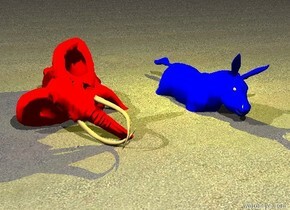 the donkey is right of the tiny elephant. the tiny elephant is in the ground. the donkey is 10 inches in the ground. the ground has a sand texture. the yellow light is above the donkey. it is cloudy. the shiny road is on the mountain range. it is 50 feet long. the huge rock is behind the road. the stone wall is in front of the road. it is 25 feet wide. 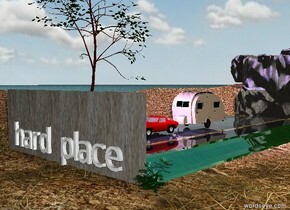 the large "hard place" is in front of the wall. the vehicle is on the road. the small car is in front of the vehicle. the mountain range is dirt. the pink sky is cloudy. the pink light is 3 feet above the vehicle. the blue light is 1 foot behind the pink light. the ground is water. the tree is to the left of the road. the bush is to the right of the wall. 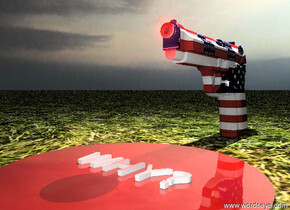 the american gun. the sky is cloudy. the red pond is -3 inches in front of the gun. the pond is 1 foot wide. the pond is shiny. the very tiny red illuminator is in front of the gun. the illuminator is 6.5 inches above the ground. the "WHY?" is on the pond. the "WHY?" is 6 inches wide. the "WHY?" is facing up. the ground is grass. the tiny white illuminator is 8 inches above the gun. 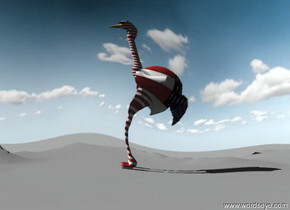 the humongous american ostrich is on the tall mountain range. it is partly cloudy. 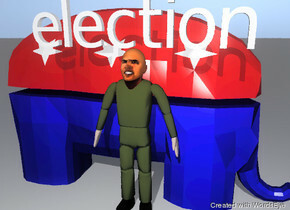 obama is in front of the republican elephant emblem. he is furious. he is matte. the "election" is above him. the huge "O" is on the shiny ground. the row of 9 very huge red fish are to the right of the "O". the huge "CIALS" is to the right of the row of fish. the ground is water. 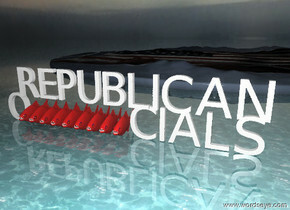 the huge "REPUBLICAN" is 1 foot above the row of fish. the small american mountain range is 40 feet behind the row of fish. it is cloudy. the american wall. The clown is 1 foot in front of the wall. 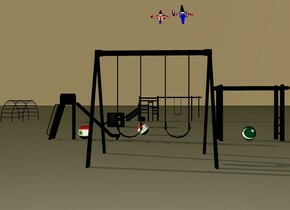 the clown is facing left. the clown is running. 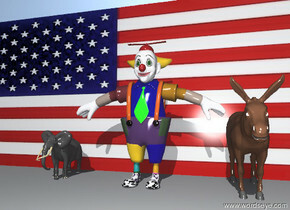 the donkey is 3 feet to the right of the clown. the tiny leaning elephant is to the left of the clown. the tiny elephant is facing left. the tiny elephant is 2 feet above the ground. the american wall. The clown is 1 foot in front of the wall. 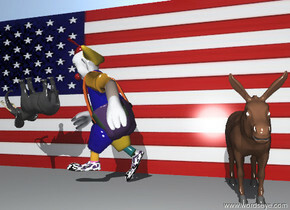 the donkey is to the right of the clown. the tiny elephant is to the left of the clown. the bridge is -19 feet in front of "Nowhere". the bridge is facing left. the bridge is 12 feet tall. the "Nowhere" is 25 feet tall. 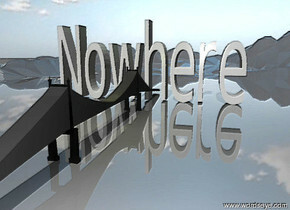 the "Nowhere" is on a very tall mountain range. it is partly cloudy. The "Nowhere" is 5 feet deep. The "Nowhere" is 60 feet wide. The mountain range is shiny. The very bright green illuminator is 10 feet above the "Nowhere". The very bright yellow illuminator is above the bridge. The matte wall is 500 feet wide and 20 feet tall.. The 50 feet wide unreflective image-282 cube is 4 feet behind the wall. 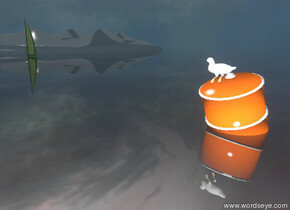 the 25 feet tall peach puff unreflective hand is 10 feet to the left of the cube. the hand is 20 feet above the ground. The brick image is on the wall. The brick image is 5 feet wide. The gigantic silver coin is above the hand. the gold jesus is on the desert ground. 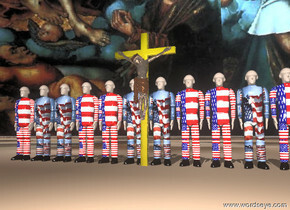 the 12 american soldiers are behind the jesus. the sky is god. The cow is white. The cow's head is blue. 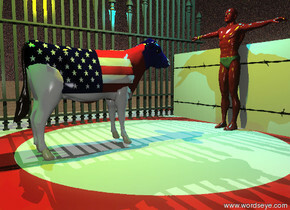 The cow's body is american flag. 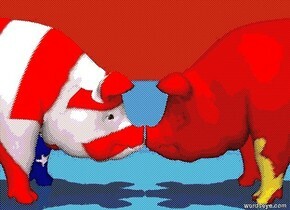 The cow's neck is red. The 4 foot tall swimmer is next to the cow. The swimmer is facing the cow. The cow is facing the swimmer. The cow is two feet away from the swimmer. The sky is a texture. The swimmer is soviet. The fence is 3 feet in front of the cow. 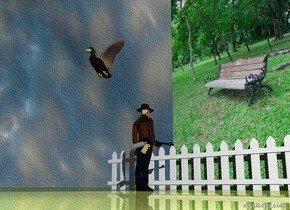 There is another fence next to the fence. There is a very small wall next to the swimmer. The wall is facing the swimmer. The wall is a texture. The ground is a wood texture. The swimmer is on a mat. The cow is on the mat. The yellow illuminator is 2 feet above the cow. The white illuminator is dim. The green illuminator is 3 feet from the yellow illuminator. The cyan illuminator is 3 feet from the yellow illuminator and 6 feet from the green illuminator. the leaning barrel is in the ground. the ground has a grey cloud texture. the texture is 20 feet wide. the small bird is on the right side of the barrel. the bird is facing front. the huge tall island is 100 feet in front of the barrel. the sky is cloudy. the boat is 20 feet behind the island. the boat is on the ground. the ground is shiny. a gigantic earth sphere is behind the tiny satellite. the sky has a starfield texture. the ground is invisible. 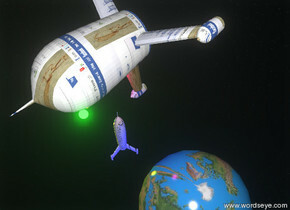 a tiny green flying saucer is in front of the satellite. the shiny grey plate is on the hand-vp21464. the small pizza plate is on the plate. the small american cup is to the right of the small pizza plate. the cup is facing right. 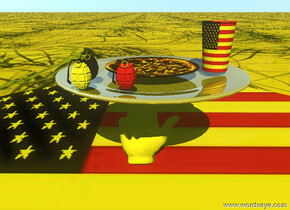 the tiny white grenade is to the left of the small pizza plate. the tiny white grenade is 1 inch in front of the small pizza plate. the tiny blue grenade is one inch behind the tiny grenade. the tiny red grenade is 1 inch to the right of the tiny white grenade. the hand is on the small round american rug. the ground is grass. the sun is gold. 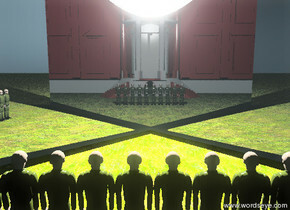 ten soldiers are on the grass ground. the there is a huge reflective wall 1 feet in front of the soldiers. the wall is facing northwest. there is a giant shiny wall 1 feet in front of the soldiers. the wall is facing northeast. there is a gigantic white light in the wall. the american white house is 15 feet behind the soldiers. the impi-39 billboard is on the tall mountain range. the road is in front of the billboard. the road is facing left. the truck is on the road. the truck is facing right. the cube is on the right of the truck. the cube is 2 feet wide and 1 feet tall. the cube is 1 inch deep. 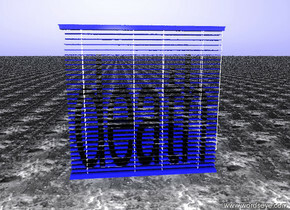 the design-img-iz1224 texture is on the cube. the cube is facing right. the cube is 2 feet above the road. 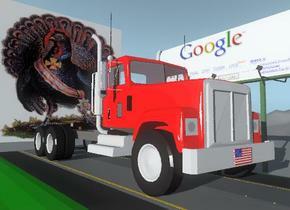 the humongous turkey cube is to the left of the truck. the turkey cube is 2 feet above the road. the checkerboard cube is next to the turtle cube. 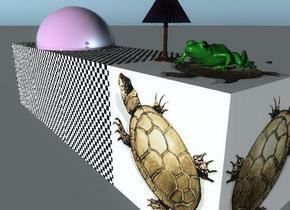 the dark green frog is on the turtle cube. the checkerboard cube is 3 feet wide and 12 inches tall. the tiny lamp is on the checkerboard cube. it is to the left of the frog. the shiny violet sphere is in the checkerboard cube. it is 1 foot to the left of the lamp. 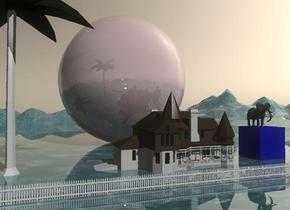 The house is 10 feet in front of the shiny pink sphere. The sphere is 60 feet tall. 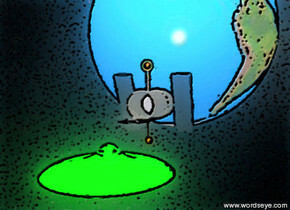 The sphere is on the tall shiny mountain range. The mountain range has a water texture. The palm tree is to the left of the house. The elephant is on an enormous blue cube. The cube is 10 feet to the right of the house.The white picket fence is 10 feet in front of the house. It is 80 feet wide. the sky is tan.